Globally, South African adolescent girls have some of the highest rates of both unintended pregnancies and sexually transmitted infections, including HIV. Such outcomes can result in numerous adverse health or socioeconomic consequences including elevated risk of maternal and infant mortality, decreased educational attainment and exacerbation of poverty, among others. In 2016, Jennifer Brown, PhD, an associate professor in the Department of Psychiatry and Behavioral Neuroscience at the University of Cincinnati (UC) College of Medicine, was the recipient of a Grand Challenges Explorations grant, an initiative of the the Bill & Melinda Gates Foundation. This grant helped Brown pursue an innovative global health and development research project to assist with the family planning needs of these adolescent girls. Their work is focused in the Sesotho-speaking region of Bloemfontein in the Free State province in central South Africa, about four hours from the metropolitan area of Johannesburg. While there’s been a lot of work around HIV prevention health education, says Brown, it has typically been focused in major metropolitan regions and in the coastal cities. “And in more rural, less populated areas like the Free State province, there has been very little work done in around the dynamics of HIV risk,” she adds. “Cultural factors that affect teenagers’ reproductive health decisions may also be different relative to those in the bigger cities. We asked, ‘What do you think other young women are doing?’, the idea being that it’s a lot easier to talk about someone else, rather than yourself. Brown partnered with loveLife, an organization based in South Africa, aimed at educating young people about their health and encouraging them to give back to their communities. The research team engaged well-known peer leaders from the community, partnered with the Ministry of Health and other community-based groups to develop the questions and methods for the study. “We took the tack of going in completely naive, asking the young women to tell us, ‘What do you think other young women are doing?’, the idea being that it’s a lot easier to talk about someone else, rather than yourself,” says Brown. Among their findings was that abstinence was reported as a prominent prevention method, and only a minority of participants reported a history of sexual activity, reinforcing that their targeted age range of 14-17 may be optimal for interventions to prevent unintended pregnancies and sexually-transmitted infections, like HIV. 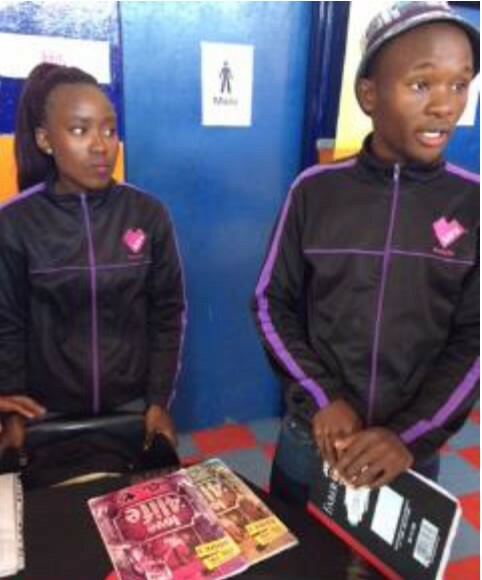 One of the groups they met with during the study was loveLife, an organization with a presence across all of South Africa aimed at educating young people about their health and encouraging them to give back to their communities. Brown says that working with loveLife was a powerful collaboration and that she and her colleague were even featured on a radio show run by loveLife teen volunteers. 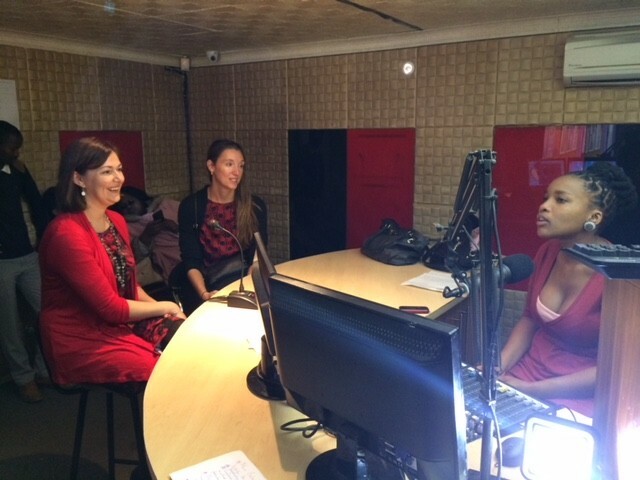 Brown and research colleague are guests on a loveLife youth radio show while they were in South Africa on a Grand Explorations Challenge grant researching family planning needs. photo/ Jennifer Brown. “I think because South Africa has such a high prevalence of HIV, disproportionately affecting black South Africans, there is a greater openness with the topics of sexual health,” she says. “It’s not without challenges, but our community partners were very supportive of the work and want to see it continue and expand.” Brown says the project turned out to be a highly successful collaboration. “In 18 months, we expanded our partnership with the University of the Free State and local community based organizations, hired research staff on the ground in South Africa, implemented the study, recruited 450 teenagers with parental consent to participate and established strong community buy in,” she adds. Looking ahead, Brown hopes they can take their findings and work with their new partners to modify the current sexual health curriculum in schools across South Africa and adapt it to have a greater emphasis with a joint focus on pregnancy and STI/HIV prevention through a youth-led approach. Featured photo at top: Jennifer Brown, PhD. Photo/ Colleen Kelley/ AHC Communication Services. The University of Cincinnati is classified as a Research I institution by the Carnegie Commission, and is ranked in the National Science Foundation's top 35 public research universities. UC's graduate students and faculty investigate problems and innovate solutions with real-world impact. Next Lives Here.